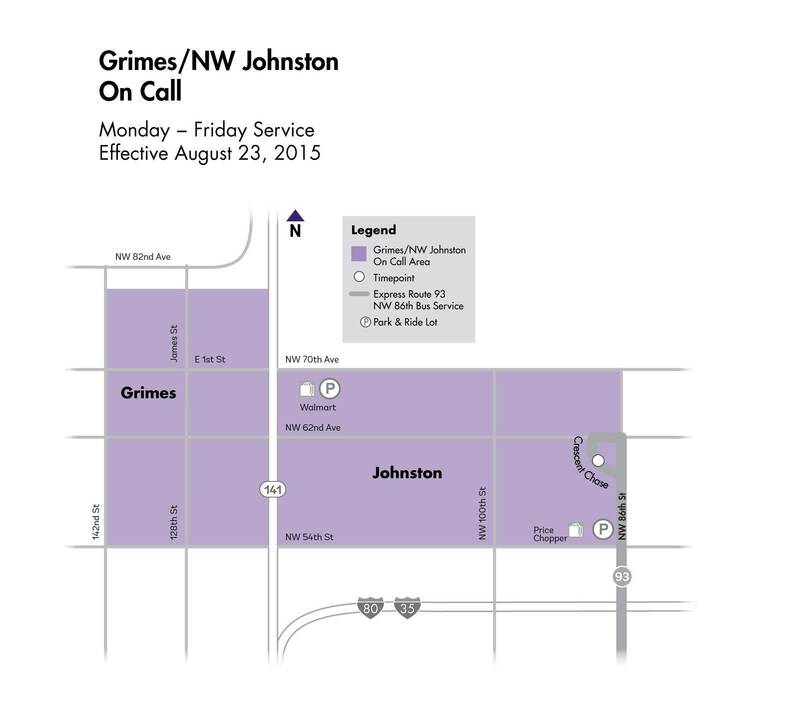 Service operates between Grimes and northwest Johnston area, including service the Walmart Park & Ride. The shuttle will take you from a location close to your home or workplace to the nearest transit stop or other destinations within the service area. Weekdays -- 5:45 to 7:45 a.m. and 3:45 to 6:10 p.m. (primarily to and from the DART Park & Ride at Walmart). Chase. Express Route 93 schedule on the other side. If you leave a message requesting an On Call trip, a DART On Call representative will return your call as soon as possible. Service is available on a first-come, first-served basis. Same-day trips can be made, on a space-available basis, by calling 515-782-5315 at least 30 minutes in advance. DART’s On Call representatives will make every effort to accommodate your trip needs. During periods of high demand, your trip request may be more easily accommodated if you are willing to travel at a slightly different time or by a less-direct route to your destination. To cancel or change your flex trip reservation, call 515-283-8136 or 515-782-5315 during DART service hours and at least 30 minutes prior to the scheduled pick-up, or a no-show will be recorded. More than four no-shows in a calendar month may result in a suspension of your On Call service. In case of an emergency, DART will guarantee a ride home to individuals riding the Grimes/NW Johnston On Call, between the hours of 8 a.m. and 3:30 p.m., Monday through Friday. To qualify for a Guaranteed Ride Home, you must be a monthly bus pass holder, Unlimited Access participant or RideShare vanpooler. For full program details, click here. Zone: The reservation-based neighborhood shuttle service provides transportation between Grimes and the Northwest part of Johnston. The service also operates from the Wal-Mart Park & Ride lot at scheduled times in the morning and afternoon for an easy connection to and from the Route 93 NW 86th Express at Cresent Chase. Days and Hours Of Operation: Monday through Friday 5:45 to 8:45 a.m. and 3:45 p.m. to 6:30 p.m.